Learning and exploiting problem structure is one of the key challenges in optimization. This is especially important for black-box optimization (BBO) where prior structural knowledge of a problem is not available. Existing model-based Evolutionary Algorithms (EAs) are very efficient at learning structure in both the discrete, and in the continuous domain. In this article, discrete and continuous model-building mechanisms are integrated for the Mixed-Integer (MI) domain, comprising discrete and continuous variables. 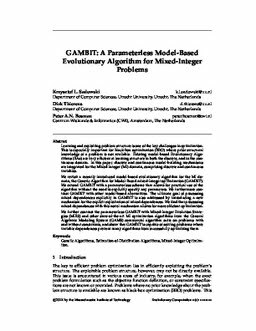 We revisit a recently introduced model-based evolutionary algorithm for the MI domain, the Genetic Algorithm for Model-Based mixed-Integer opTimization (GAMBIT). We extend GAMBIT with a parameterless scheme that allows for practical use of the algorithm without the need to explicitly specify any parameters. We furthermore contrast GAMBIT with other model-based alternatives. The ultimate goal of processing mixed dependences explicitly in GAMBIT is also addressed by introducing a new mechanism for the explicit exploitation of mixed dependences. We find that processing mixed dependences with this novel mechanism allows for more efficient optimization. We further contrast the parameterless GAMBIT with Mixed-Integer Evolution Strategies (MIES) and other state-of-the-art MI optimization algorithms from the General Algebraic Modeling System (GAMS) commercial algorithm suite on problems with and without constraints, and show that GAMBIT is capable of solving problems where variable dependences prevent many algorithms from successfully optimizing them.